"cheeses, fruits, matching port wines," by The Gifted Photographer on Flickr. To be honest, when on my own, I don't give too much thought to pairing drinks with cheese or any other food for that matter. As long as it's on hand and cheap, that's good enough for me. If, however, I were to follow a rule for selecting a beverage for a particular dish, it would be to stick close to home--the domain of both the food and drink, that is. While enjoying an alpine cheese, for instance, I'd drink a Swiss beer or wine. Same goes for French cheese and wine, etc. I'm even exploring, with cocktail maven Kara Newman, monastic cheeses with monastic spirits for the Manhattan Cocktail Classic in mid-May. Foods and drinks from the same region tend to go well together, and it's what the locals (even monks!) do. For this reason I primarily gravitate toward ale and cider with my favorite cheese (you know which one!). Why, then, am I suggesting classic drinks from the Iberian peninsula as potable accompaniments to Cheddar? There ain't much Cheddar in Spain or Portugal (and what there is, save what's on offer at the upscale cheese shop Poncelet in Madrid, is pretty crappy). There is, however, a strong English connection with Port from Portugal and with Sherry from southern Spain. Keep in mind that Port is an English innovation, and many Sherry cellars were established by English families. It shouldn't be too much of a mental stretch to twin Port with Cheddar. After all, Stilton, the king of English cheeses, can hardly be mentioned without this fortified wine. Its sweet richness is a welcome foil to the savory saltiness of the blue cheese. (Just don't pour a perfectly good Port into a hollowed out circle of a perfectly good Stilton--what a waste!). Port and Cheddar can work amicably together, too, bringing out the best in each other. 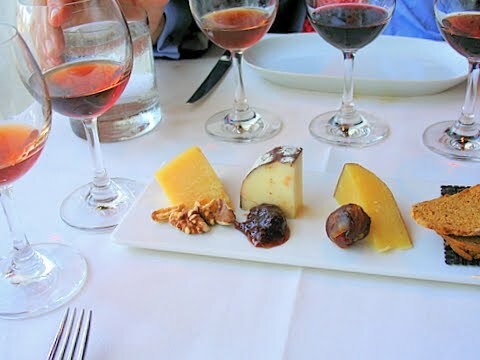 When drunk with a slightly sour domestic cheese, like Mountain Valley Gootessa Sharp Cheddar--as I did a few years back at a class at Murray's Cheese Shop, "Night Cap 'n' Cheddar, Perfect Togeddar: A Port and Cheddar Pairing," led by Sue Sturman of Epicurean--Port becomes increasingly fruity. With a barnyard-y English cheese, like Keen's Farmhouse Cheddar, the Port tames the barnyard and calls forth its richness. Yummy things can happen when they're consumed together. Manchego, or another aged Spanish sheep's milk cheese, is probably what first comes to mind when pairing Sherry with cheese. It's a classic match. While I've never drunk Sherry with Cheddar in the same studied way that I did with Port at Murray's, just recently I attended an illuminating lecture on authentic Sherry (i.e., only those wines that are produced in the Jerez region in Andalusia), organized by the Culinary Historians of New York, at the International Wine Center, and learned that Sherry pretty much goes with everything. Very food friendly, Sherry boasts more varied flavors and styles than any other wine in the world. You're guaranteed to find a Sherry that goes perfectly with a hunk of Cheddar. How about a rich, dark, and dry Oloroso? Or add a touch of Amontillado to a beer and Cheddar fondue, as Fine Cooking recommends, to contribute a nutty touch and a depth of contrasting flavors? Another factor in Sherry's favor is its affordability. Not hip and fashionable like other Spanish wines, Sherry has yet to be "discovered" and this keeps its price low, at least in the U.S. Port's another story, but there are still bargains to be had. Intrigued? Read more about Sherry in my blog for Sickles Market, due out this Friday. You know I like to talk about Cheddar. This blog wouldn't exist if I didn't! But the on-line world of CheddarBound hasn't been my only platform for spreading the word about this cheese (if you can believe it!). In the past six weeks, I've been out and about, away from desk and computer, getting the message out there. For two successive nights in early February, I ventured forth from suburban New Jersey, where I've been chilling as a slacker for the past seven months, to lead two cheese and beer tastings. The first was held at Murray's Cheese Shop in Greenwich Village. Twenty or so people attended the class and listened to fermentation guru Chris Munsey and me talk about "English Ales & Cheddar: Best Mates." Chris led the way with his potent selection of English Ales (by the end of the 1.5-hour class I was feeling no pain! ), and I followed with information about six different clothbound cheeses (not all Cheddars, and not all from England): Kirkham's Lancashire, Appleby's Cheshire, Sparkenhoe Red Leicester, Blue Mont Cheddar, Quikes Cheddar, and Cabot Clothbound Cheddar. The next night, I was on my own, but was very competently assisted by the staff of Jimmy's No. 43 in the East Village, where the tasting was held, and by my dear friend Rich Pinto, who cut individual portions of five different cheeses, Keen's Cheddar, Isle of Mull, Montgomery's Cheddar, Sparkenhoe Red Leicester, and Stichelton, while I was talking. All five dairies are located in the U.K., and I visited each of them during my 10-month Great Cheddar Adventure. That trip, in fact, was the subject of the evening's gathering. As well as tasting the cheeses (see photo above), the forty people who attended also sampled a cask ale from Somerset, a "hard" cider from New Hampshire, and an apple wine from Enlightenment Wines in the Hudson Valley. It was a lovely and lively evening, and I am so appreciative that Jimmy Carbone gave me a venue to share the stories of my travels with old friends and new. After a two-week trip to Mexico during the final miserable days of February (I fortuitously missed two snow storms), I'm chatting about Cheddar again, but this time not far from the realm of cyberspace. For my employer, Sickles Market in N.J., I wrote an entry for their blog which is a new feature on their Web site, and this Sunday I'm heading back into New York, to Brooklyn, to be interviewed by the one-and-only Anne Saxelby on her weekly radio program, "Cutting the Curd," on Heritage Radio. You can catch us live from 2:30 to 3:00 p.m. at http://www.heritageradionetwork.com/programs/14 or download the show at a later date. My next speaking engagement won't be until mid-May, when I'll be teaming up with spicy cocktail expert Kara Newman to lead a seminar on monastic drinks and cheeses at the Manhattan Cocktail Classic. Until then, fair reader, is there anything in particular about Cheddar that you would like to read about in this blog? Do let me know!